We have made 11 loans – some bigger, some smaller, divided into nine countries across the world. Four of our original loans have been fully paid, and we have found new projects in new countries to fund since then. Tatyana from Ukraine sells various retail goods at one of the markets in Pavlograd, an industrial city in eastern Ukraine. She has her own retail outlet, located in the food rows of the market. Tatyana has been in this business for 16 years. Tatyana needed a small loan to purchase bags, jars, lids and other household goods for canning berries, fruits and vegetables. Summer is the season for canning for many people in Ukraine. Many Ukrainians love dachas and grow their vegetables on small land plots, and then can fruits and vegetables to prepare for the winter. Tatyana knows about this Ukrainian tradition and wants to get ready for the busy season and increased demand. Phuong is an entrepreneur who lives with her family in Ho Chi Minh City, the largest city in Vietnam. Phuong earns an income by running a business of producing and selling shoes. She started this business fifteen years ago. Phuong wanted to take a loan to expand her current business. With the loan, she bought leather materials and accessories for producing a greater variety and quantity of shoes. We invite you to take part in Comptel’s team and help us provide financial services to low-income individuals or to those who do not have access to typical banking services. By helping people around the world build businesses, we can do our part to help communities around the world grow stronger and more vibrant. This post was written by Ulla Koivukoski, SVP of Comptel’s Analytics Business Unit, and Malla Poikela, senior product marketing manager. The new normal today is that we live in an ocean of data. Now, it’s up to companies to transform that data into actionable insights that can have a real impact on business. In the telco industry, creating a vision for data hinges on creating insights based on customer behaviours and around the networks that provide the data in the first place. For that reason, communications service providers (CSPs) face a unique opportunity when leveraging the power of Big Data. Applying realtime analytics can deliver a holistic and contextual view of customer habits and preferences, and show exactly how CSPs’ underlying infrastructures may be affected by them. Any CSP that has delved into the depths of Big Data knows that the sheer amount of information at their fingertips can be staggering. That’s why an intelligent mediation environment is crucial for processing the customer and network information and helping to transform that knowledge into concrete insights. With a mediation platform, in-built predictive analytics can be used in tandem with insights visualisation tools to enable operators to make real-time, automated decisions and actions based on the experience of an individual customer in his/her activity on the network. These insights aren’t stale numbers; they’re dynamic and are contextually relevant for each individual customer. Analytics-enriched intelligent mediation can lead to unprecedented personalisation when it comes to marketing offers and business development opportunities. Today, those focused campaigns are a must – one survey from Vanson Bourne, in fact, confirmed that nine out of ten consumers wanted more personal interactions with their mobile operator. Previously, data was the domain of business intelligence (BI) teams that would collect, analyse and then disseminate information throughout different departments. But that’s all changing. New insights and analytics tools have made analysis easier and more accessible than ever before, so data is becoming democratised. This means that the same dataset with insights and predictions can be made available for all decision-makers across an organisation instantly, regardless of department (as Ulla has written before). If all of the relevant silos have access to that information, marketing, technology, IT and business development can be streamlined, and silos are removed from the equation. In short, accessible data blurs the borders between different company departments. The CIO, CTO and CMO can easily work from the same set of information to get insights about customer behaviour, prevent QoS driven churn, improve network and service quality, and create more sophisticated and targeted campaigns. At Comptel, we’ve said it before and we’ll say it again: the future of marketing is networks, and the future of networks is marketing. Given the massive amount of customer data available, CSPs already have the power at their fingertips. They just need to get the right tools for the job, so it’s possible to reach out and grab it. The array of complex services delivered by utilities is far-reaching and continues to grow thanks to increasing demand, uncertain commodity prices and fluctuating regulations. One new report speculates that new technology is a must for the industry, especially given the transformation of utilities from solely energy providers to energy service providers (i.e. efficiency, home services, etc.). More services mean more complex, internal infrastructure. To stay running, utilities depend on everything from virtual private networks (VPNs) and inter-site VoIP to external connectivity and detailed inventory navigation. The huge capital investments in new networks also need to be justified piece by piece. If these operations aren’t managed properly, there can be bandwidth and connectivity issues. The average utility has a lot of moving parts, just like communications service providers (CSPs). As with utilities, the pace of change in the telco space can leave businesses scrambling for new solutions. Declining revenues from traditional services like SMS and profit margin threats presented by Over-the-Top (OTT) providers has made adaptation a necessity. Service packages have also become more complex; subscribers want to pick and choose between an array of different services, and customers often want to update packages at a moment’s notice. CSPs have had to start making some significant changes. A flexible and adaptable approach to product and service management is fundamental in the telco industry today, because creating a new order process for every type of product or bundle offers little-to-no options for scalability. Utilities, too, have sprawling infrastructures, diverse and enormous user bases and business models that have remained static for decades. Now, some are implementing new solutions first pioneered by CSPs that can help make operations more efficient than ever before. CSPs have increasingly turned to integrated service fulfillment platforms that help bridge customer orders and service deployments. This centralised platform approach offers automated delivery and granular visibility across the order process, empowering CSPs to reduce time-to-market and experiment with new services and bundles. In much the same way, utilities can benefit from turning to integrated service fulfillment platforms. This technology allows communications within utilities to become streamlined. Comptel Service and Resource Inventory can provide highly flexible, context-sensitive inventory management that is adaptable to changing and converging network technologies, for example. Commissioned services and equipment can be tracked and distributed from start to finish, and network assets can be accurately deployed to maximise utilities’ revenues and reduce their operational costs. At the end of the day, centralising operations through a fulfillment platform can make utilities leaner and more nimble at a time when adaptability is key to profitability. Right now, the majority of utility companies are growing without a scalable solution in-hand. This can lead to breakdowns in connectivity that result in costly network errors. By moving operations to one central, integrated platform, it’s possible to keep track of everything that goes into the delivery of resources to different sites. The streamlining of operations through integrated service fulfillment platforms can reduce the total-cost-of-ownership for the utilities industry. CSPs have been managing the massive influx of data through these solutions and other enterprise businesses with complex services and vast infrastructures can do the same. The world likes infographics. In fact, one study (in infographic form!) even states that people are 40 percent more likely to read a high-quality infographic than a text article. What’s the appeal? Well, these data visualisations make it easier to communicate complex ideas more effectively. They’re also mobile-friendly and ripe for consumption for the pinch-and-swipe generation. Yet most readers don’t stop to consider what’s really being visualised. Infographics are fueled by Big Data. In particular, a specific vision for Big Data that’s been laid out carefully, with a strategic goal behind it. This infographic about customer retention is a brilliant model for what Big Data can accomplish when a visual element is added to bring actionable insights to life. With images, charts and graphs to help the reader along, a portrait of loyalty evolves in a way that makes the viewer appreciate the findings even more. More importantly, this infographic shows what Big Data can accomplish when there’s a vision behind it. In this case, a vision of customer loyalty was supplemented and constructed with concrete data points. At a glance, we can see the main reasons customers leave businesses and what a company can do to remedy the situation. These findings are compiled from over 15 different sources, but since the infographic consolidates the data, there’s a cohesive narrative. Many communications service providers (CSPs) today have the capacity to collect a lot of information from customers, too, but that data is hardly ever leveraged contextually or holistically. The eyes are there, but the vision is not. “When Customers Stick: Customer Retention by the Numbers” shows us that trends can emerge quickly when data is applied with a purpose. 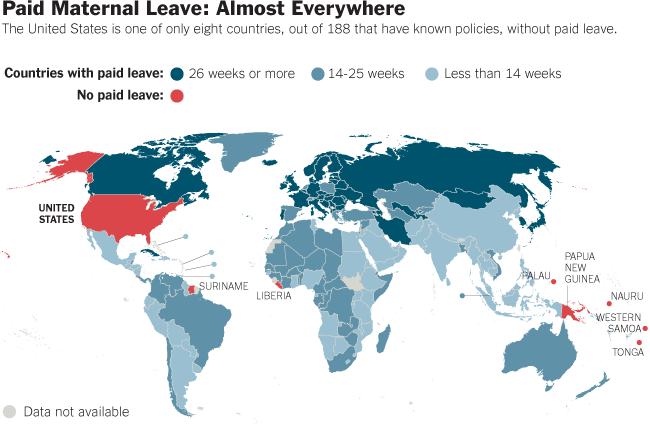 Another great example is a map of countries with paid maternal leave, courtesy of The New York Times. Again, labor practices, regulations and beliefs are all rolled up into one image here, showing that data, when applied to a vision, can be very powerful. CSPs can greatly benefit from data visualisation techniques, because they can help form a concrete objective behind the information. Consider how important a map or infographic of customer data usage (like this visualisation of daily global Internet usage) can be to a future marketing campaign. By compiling specific segments of data, CSPs can create a clear depiction of the different needs of their customers, and leverage that to create contextual offers and tactics that better meet individual preferences and behaviours. When a business combines a vision with data, the rest falls into place. Whether CSPs are wondering whether an LTE deployment would be profitable in a certain city or a specific region would be likely to purchase a new service bundle, Big Data can help shed light on trends and bring underlying behaviours to the forefront. Tools like predictive and automated analytics help CSPs take both structured and unstructured data at the company’s disposal and create actionable insights from it. The maps and infographics are visualisations generated by historical data. Imagine if a business had the tools to compile that information and apply predictive analytics to it, forecasting and envisioning potential outcomes and trends. This is all proof that a lot of complex information can be leveraged to make data beautiful. And, by making data beautiful – and meaningful – CSPs can fully realise their business vision. This week, management consulting firm Northstream released a whitepaper showcasing how advanced analytics can help communications service providers (CSPs) improve all areas of their businesses. “Analytics Beyond the Hype” offers readers an overview of analytics in the telco space, demonstrates case studies from analytics vendors (including Comptel) and explores strategies that CSPs can apply to their business models today. Specifically, the whitepaper charts the evolution of analytics from silo-specific, disorganized data to more consolidated efforts, as CSPs attempt to derive value from their Big Data and achieve their business goals. While analytics are not new, Northstream writes, the application of analytics to cross-departmental data is ground-breaking for many operators. In the past, traditional reporting has been limited to hard statistics like the state of the network, customer count and finances. Northstream found that CSPs that are exploring the most advanced analytics tools are using data to build predictive models and real-time engines for offers that can immediately meet customer needs. Additionally, there’s a noticeable trend moving from mass marketing to personalised, individual marketing. These developments in the world of Big Data analytics are imperative for CSPs looking to grow their businesses. Northstream states that, among European CSPs, ARPU has decreased by 6.6 percent year over year. Telco services are getting commoditised, and the market saturated, so the solution is for operators to differentiate by using their data. We were honoured to be included among the experienced CSP analytics vendors Northstream worked with on this study and encourage everyone to read it!